Give your cat a skittering good time with our interactive pull-string Skedaddles Cat Toys! Pull string activates the fun! Get your video cameras ready for a game with your cat everyone will love! One pull of the cord will send these crazy, 3" characters skittering and jittering across the floor, driving cats wild wherever they go! Soft plush and high-contrast colors invite playful cats to pounce and play. Most models have a fluffy tail that playfully tempt your cat as they buzz across the floor. The tails and ears provide nice nibble places to grab and carry their "prey." Daily play with your cat helps your kitty to get their proper amount of exercise and can curb behavioral problems. Playing with your cat also helps create a strong bond with you. These fun pull-string plush toys are a great way to enhance your pet's relationship with you and help them get in touch with their inner hunter. 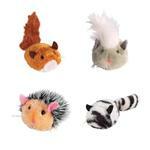 Choose Spike the hedgehog, Shakes the mouse, Chip the squirrel, or Zeb the Racoon. They're so fun and cute, you'll want to collect them all! Battery-free fun for the whole family! This tired squirrel skedaddles for about 6 inches and stops. Giving it two stars because at least it's something they can still bat around if they wanted. I bought this toy for my miniature schnauzer, and he absolutely loves it. It keeps him entertained for hours. Posted On 12/24/16 by Rebecca R from GlenDale, WV Yes, Rebecca R recommends this product! Posted On 12/11/15 by Robyn C from Bostic, NC Yes, Robyn C recommends this product! Our cat person Pep loves his Zanies Skedaddles Cat Toys. He romps and plays with it for 30 minutes at a time. NO joke. They squeak and charm the little guy, and he wouldn't be without his little toy. He actually searches for it every morning. You have outdone yourselves, Baxter Boo. We are a non profit agency that has as it's mission to rescue dogs and cats from high kill shelters in our city. We are dependent upon donations and grants for our vet bills, and supplies. All of our animals are in foster homes. We give each foster parent a leash, collar, harness, dog bed , food and toys for their foster pet. We were fortunate to receive a grant that was specific to the purchase of these items. Your site is EASY to use, easy to correct when we were figuring out the order. I love the pop up support option. I did not need this option since the site was so user friendly.